3DTV Play does more than just enable 3D gaming. It opens up the possibilities of your PC for full 3D Blu-ray support. Nvidia’s 3D Vision has gotten some amazing reviews. The combination of software and hardware takes games traditionally viewed in two dimensions and expands them to three. It’s not horribly expensive and it works out beautifully, but it won’t tackle 3D Blu-ray technology. 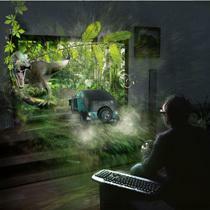 3DTV Play, Nvidia’s most recently announced piece of software, solves that problem. Compatibility is a cinch. If you’ve got a GeForce graphics card with an HDMI or DVI out – a 3D capable TV and glasses are required of course – you’re good to go. Simply pick up the new Nvidia software, install it, and enjoy 3D playback of your Blu-ray discs. You’re not going to get 3D in 1080p60 since you’re still going over HDMI 1.3, but 3DTV Play supports the much more common to Blu-rays 1080p24 so you’re not missing too much. Gamers will be happy to know that 720p60 is supported as well, so you’re set to enjoy the gaming 3D standard as well. 3DTV Play will be $39.99 when it launches this spring. If you’ve already picked up Nvidia 3D Vision, you can get 3DTV Play absolutely free. Not a bad setup!